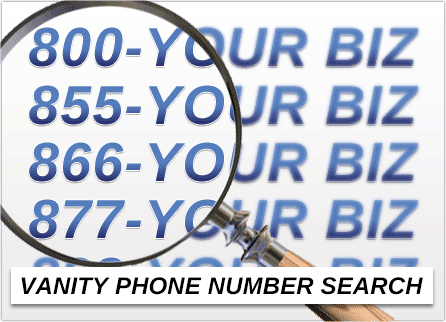 Businesses can use our vanity phone number search at no cost. Our search tool allows you to instantly scour the FCC’s national database of spare toll free numbers to find a custom phone number that spells any word or phrase. Our vanity telephone number search tool shows you which numbers are available for purchase and which numbers are already being used by other companies. Additionally, our search tool works as a vanity number generator providing you with close-match options if the exact-match number isn’t available. 1. If the vanity 800 number you want isn’t available, try a different area code. Toll free phone numbers come in many area codes (also referred to as prefixes). When conducting a vanity number search you may want to consider searching all toll free prefixes including 833, 844, 855, 866, 877, 888, because 800 numbers may not be available. Since 1-800 vanity numbers were first released in the mid-1960s there are very few of them left in the spare pool. In many cases, the bulk of available 1-800 numbers have been scooped up by existing companies many years ago. And unfortunately, when vanity 800 numbers do become available, marketing companies nab them for misdial advertising purposes – a semi-shady marketing technique where the caller is unintentionally connected to a third-party who either tries to sell them on something or get them to take a survey of some kind. Another downside of using a true 1-800 number is that since it has likely been used by other companies many times in the past if you use it one as your business phone number, you’ll likely get calls from people looking for the form owner of the number (old customers, telemarketers, etc.). You can mitigate that types of unwanted call traffic using UniTel Voice’s automated attendant to screen calls. 3. If you search for a vanity phone number and it isn’t available, try these advanced search tricks. Vanity phone number services don’t always have the number you want. If the number you want is unavailable, try thinking of other words related to your business or industry. Brainstorming a list of words before your search will save you time and money. If you can’t find the exact match vanity number you are looking for, try using action words like “fix”, “save”, “go”, “get”, “buy”, “call”, etc. Using an action word combined with a word related to your brand or industry (e.g., 1-888-RENTACAR, 1-844-FIXROOF) can be very effective and sometimes even more memorable than just using your brand name alone. Especially if your company isn’t well known. Use wildcards (the* symbol) when searching for vanity phone numbers can help you find hidden phone number options you didn’t know were available. In vanity phone number searches you can use the wildcard function when you put an asterisk symbol (“*”) in the place of a number or letter. For example, if you wanted a vanity telephone number with the word LOAN in it you could search: 8**-***-LOAN. And the search results would provide you with all available combinations with the word LOAN in it (e.g., 844-444-LOAN, 877-123-LOAN, 833-300-LOAN, 855-764-LOAN, etc.). 3. Consider using a toll free vanity number over a local vanity number. Local vanity numbers are harder to find then vanity toll free numbers because local numbers have been decentralized and batched out to individual phone companies across North America. This means unlike toll free numbers, there’s no centralized national database you can search. If a local vanity phone number becomes available there’s no way of knowing because the number does not return to a central spare pool. There is simply no way to build a vanity telephone number search tool that can search all available local numbers like you can with toll free phone numbers. Toll free numbers are housed in a central database by an organization called Somos. This organization has been given the authority by the FCC to control how toll free phone numbers are stored, managed, and distributed. Companies like AT&T and UniTel Voice have special credentials that allow us to search the Somos toll free number database in real time and distribute toll free numbers to our customers. The vanity number search tools on our websites have a special API connection that allows us to search for numbers by word, phrase, or a numeric combination. One reason you might want to get a toll free number over a local number, beyond a wider section, is number portability. Toll free numbers are easier to transfer between phone companies for the same reason there are more vanity number options: they are hosted in third-party FCC sectioned database. It makes the porting process easier and faster and if there is a dispute, you can go to the third-party database and more easily yank your number away from your current provider. Number portability is one of the key reasons Fortune 500 companies always use them. They’re easier to control and more reliable. Another reason is that using a toll free vanity number gives your business a nationwide presence. If you decide to expand your services to a different city or state you can use the same number. Just like your business’s website domain, a vanity phone number is a marketing asset you have to manage. When it comes time to expand your business why put yourself in a position where you’ll have to print different business cards and brochures for the different areas you service. And just like if you ever sell your business, a well-branded phone number becomes a valuable asset. If it has a toll free area code it gives your business’s new owner more flexibility to expand your business into other areas of the company or start selling online. There are no borders online. And ecommerce is or can be a component of every industry’s business model in today’s market.